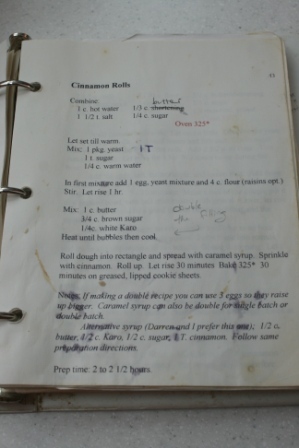 My mom has this incredible recipe for cinnamon rolls. 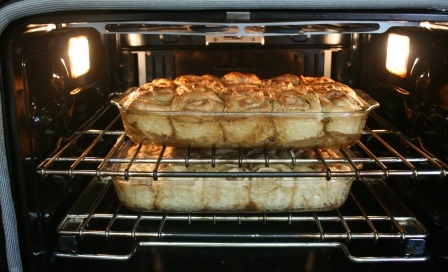 I suppose they are technically ‘caramel rolls’, but there’s cinnamon in there… so I call them cinnamon rolls. There have been occasions when I’ve asked other people what they’d call them, but they generally don’t answer because their mouths are full. Given that this is a very sticky recipe, I had almost given up hope of ever getting pictures taken without losing my camera lens to hopeless smearing, but the lovely and talented Mrs. M – find her here – graciously volunteered to be subjected to my rather verbose cooking style, and gamely held in there and snapped away while I talked and gesticulated. I start by grinding wheat. Although this recipe is arguably at its best with all white flour, the amateur nutritionist in me can’t stand to make them 100% white wheat. 50% whole wheat is still tasty. 100% whole wheat gets kinda grainy. So I go 50/50. So I took a few months and gradually typed all of my favorite recipes into the computer, and took the whole selection with me to college and later, my new home with Mr. Caffienated. Anyway. This recipe comes from the Original Collection Of My Mom’s Recipes, and has been duly dripped on, tweaked, and generally abused. You get the updated version. So. Right. Flour. 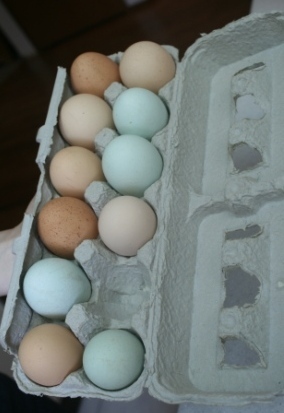 Eggs. Farm Fresh is Best. The yolks really are that color. Melt the butter and sugar in the warm water. 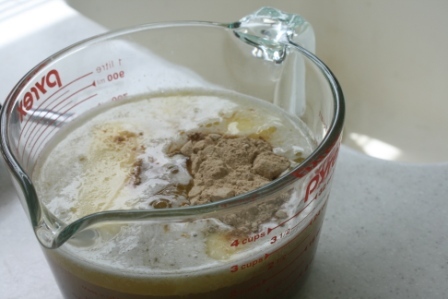 It cools off to yeast-friendly temperatures by the time the butter is liquefied. This is Very Happy Yeast. I love it when it bubbles all the way to the bottom of the glass. 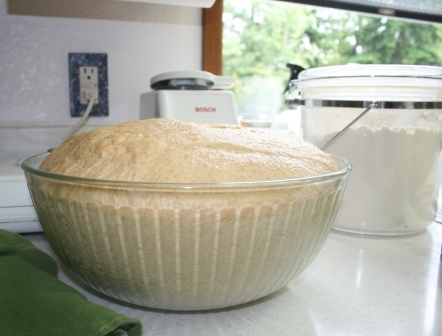 Mix it all together till you have very happy dough. 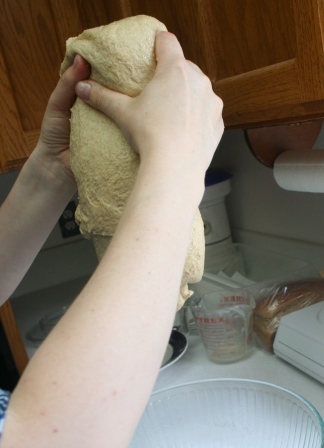 It’s a rather sticky dough. I generally have to oil my hands frequently to keep them from becoming one with the ooze. 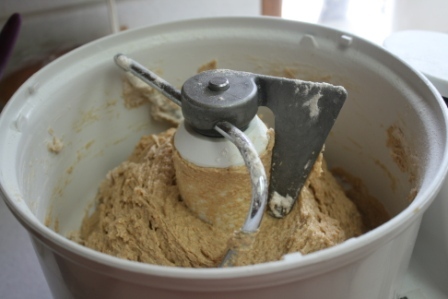 I added enough flour that the dough was cleaning the sides of the mixer immediately after being added… but the dough is still very soft and sticky. 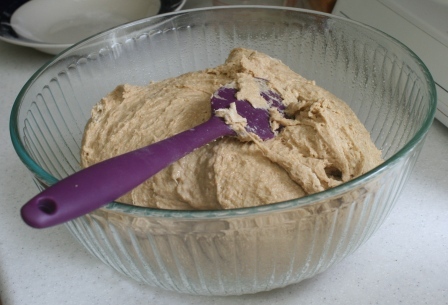 Use a spatula to persuade the dough to leave its comfortable mixer home and relocate to a nice, oily bowl. Repeat for a total of four stretches. It’s amazing how this gets rid of the stickiness. Then spray with oil, cover and let rise for an hour. 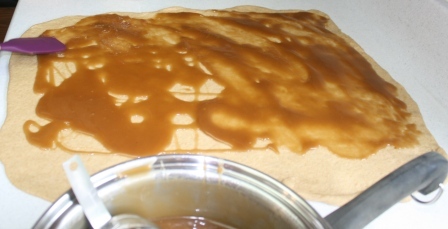 Now is the time to make the caramel. 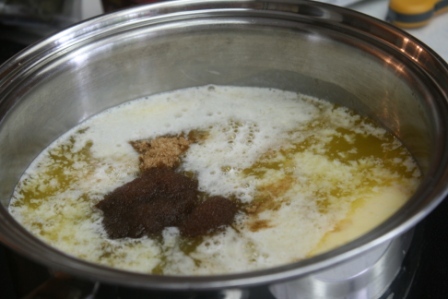 Melt the butter and sugars and syrups of various types together in a saucepan. 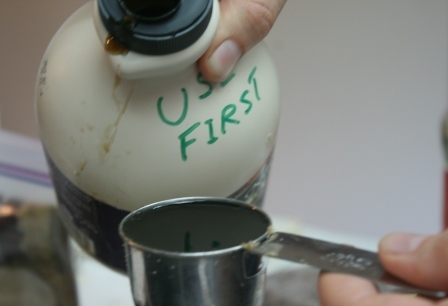 I use some corn syrup – it gives the caramel a nice sheen and candy-ness. But I swap out half for maple syrup. Somehow we ended up with two almost-full open containers of maple syrup in the fridge. So this is the designated first-use victim, or they’ll end up getting used at equal rates and taking up double the fridge space for months. Bring the sauce pan to a boil, add the vanilla, then set aside. We stirred it for awhile to get it to cool faster… and didn’t take pics of that. What’s that doing in here? 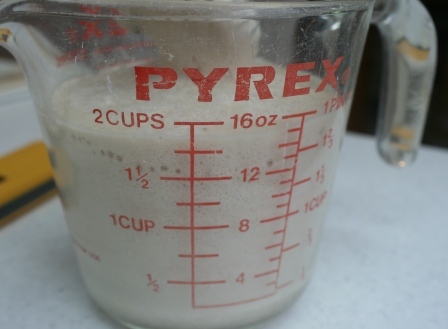 … dump it out (flour or Pam the counter first!). We did a double batch, so I divided it in half at this point. 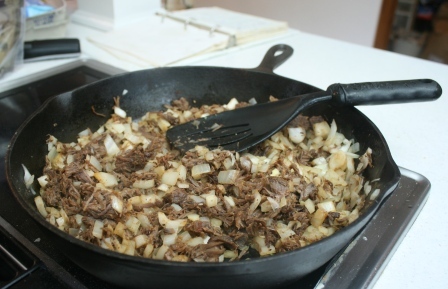 Roll into a nice rectangular shape and start adding caramel. When it’s all covered in goo – except for a margin at the edge you’ll be rolling towards – add cinnamon. 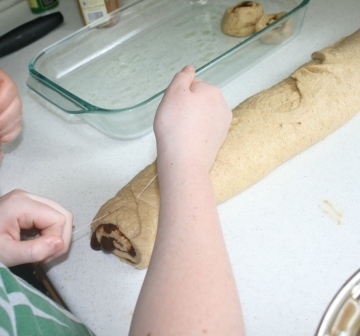 Then roll tightly towards the non-gooped edge. Bring that clean edge over the top to keep the caramel from escaping. My favorite cinnamon roll trick – cut with floss! (Unwaxed, unflavored). This works with thread as well, but floss cuts better. Lift up the roll, put the floss underneath the segment to be cut – I generally aim for 1” to 1.5”-thick rolls – then cross and pull out at a 90° angle to the floss under the roll. 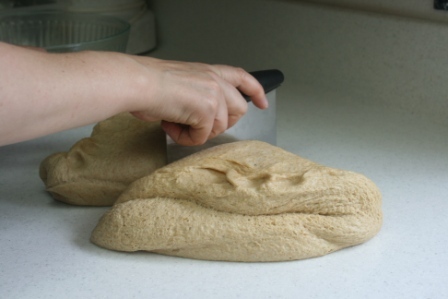 The floss comes right up through the dough and severs it. 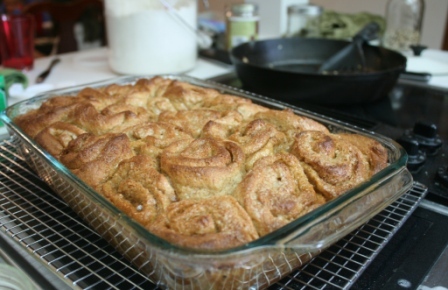 After trying to cut cinnamon roll dough with a knife for years… it’s a beautiful thing. Place rolls in pan as you go. When the pan’s full, top with more goo – I always reserve about ¼ of my caramel for this step. And start the oven preheating to 350°. By the time it’s ready, the rolls should be about ready to go in. By the time we’d finished filling the second pan, the first was ready to bake. So I ended up having rolls in the oven at different times, which is just fine. At this point we were interrupted by unplanned wildlife activity. You just know that thing went home – ‘cause you know I insisted they release it back under the woodpile to deal with mice – and told all its little snake babies about the Big One That Got Away. 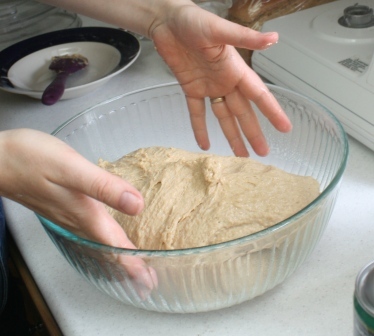 … and then we went back into the house and washed our hand thoroughly and took the rolls out of the oven and had lunch. I made a cream cheese frosting in mimicry of a certain national cinnamon roll chain that shall remain nameless… but it was not photographed due to the immediate departure of cook and photographer for plates and forks. This recipe also works well with other fillings. I’ve done an almond-and-cream-cheese one that goes over pretty well, and a chocolate-and-apricot one in an attempt to copy ‘babka bread’ from our local bakery. Go forth and roll! And don’t forget to lick out the saucepan and hoard the spatula. Let sit 5-20 minutes, then knead for 3 minutes in Bosch. 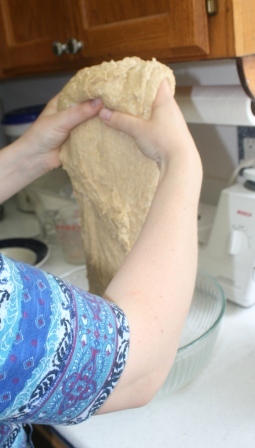 Scrape dough into large, oiled bowl. Spray lightly with Pam. 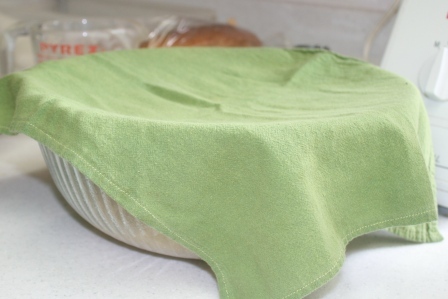 Cover with light cloth or plastic wrap. Heat until bubbles then cool. 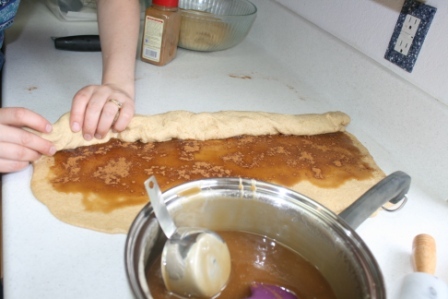 Roll dough into rectangle (very thin but not tearing, 2’x1’ approx) and spread with ½ of the caramel syrup. Sprinkle generously with cinnamon. (2-4T). Slice 1” slices with floss. Arrange in greased 13×9. 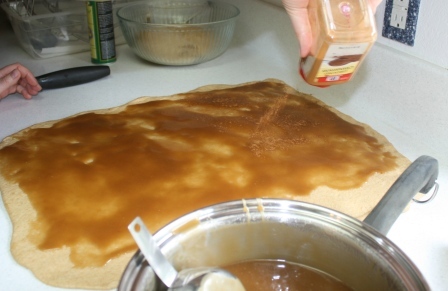 Pour rest of caramel on top. Let rise 30 minutes (generally in a warm moist microwave). Turn oven on 15 minutes before done rising. 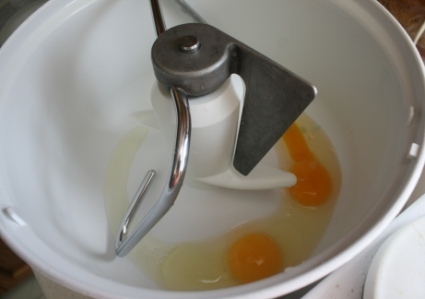 Notes: If making a double recipe you can use 3 eggs so they raise up bigger. 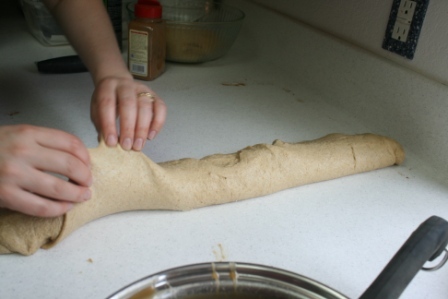 Prep time for rolls and frosting: 2 to 2 – 1/2 hours. This entry was posted in Baking, Comfort Food, Desserts and tagged caramel rolls, cinnamon rolls, cream cheese frosting, whole wheat cinnamon rolls. Bookmark the permalink. Amen to the dental floss! I discovered this method some years ago and have kept some in my spice drawer ever since. I have decided after much thought that these should be called “Carmen’s Sticky Buns”! Cinnamon Rolls just doesn’t give them justice!! That was so much fun! Once I get over this morning sickness, I want to make them again! I don’t dare while I’m still feeling ‘blech’; I might set up an aversion. But once I’m all better, I want some cinnamon! Ok, you seriously made me laugh out loud! Growing up near the amish in WI and IN, they make Sticky Buns all the time and sell them in their bakeries and such so I did not think of that until you said it!! You are hilarious! You call me when you make them and I’ll come help! Or I’ll just come help with whatever you are making! Or we can just sit on the swing and gab!